Arnold Worldwide teamed up with Mill+ to launch 'The Flame' for Jack Daniel's Tennessee Fire. The spot sets the stage for the brand's newest flavor offering by personifying a fierce combination of liquid and fire with a mind of its own. The audience travels through a swift path of pipes and vats of a dark distillery as the element decides for itself where it'll twist, turn and halt. Mill+ designers began the creative process by creating storyboards and style frames to figure out the character of the CG liquid element, which was then developed by the 2D and 3D teams. "The character in this commercial is the 'liquid fire', and it has a slight personality without being too overt," Mill+ director Paul Mitchell comments. "This presented us with a unique challenge: liquid and fire behave in two different ways. We started with lots of previsualization to lock down the pacing and mood and ended up with a combo of visual effects, art direction and storytelling. This is all thanks to a great DP, really strong effects people on and off set, and Arnold, always a brilliant agency to work with." While the 'liquid fire' character was computer-generated, plenty of practical fire was used on set. Mitchell continues, "Dealing with fire on set has its own set of parameters: the whole distillery was built in the Arts District of Downtown LA, down to the warning signs, pipes and repetitive dunking machine. There was lots of practical fire and a particular layering of shots to achieve the world and the look we were going for." The Mill's 2D team, led by creative director Chris Knight, further developed the pipes. "We used reference of super hot metal tubes," Knight explains. "What helps are the imperfections in the metal, so you get these chunks of metal at different heat levels which creates a great texture. Once you add heat haze, steam and smoke with reactive lighting to the surrounding area, the effect is complete. One tricky problem was getting the right speed of the liquid moving through the pipes to heat them up. We found that we started slower with the effect, eventually speeding up the traveling heat along the pipes to match the internal CG liquid shots - which had great dynamism." 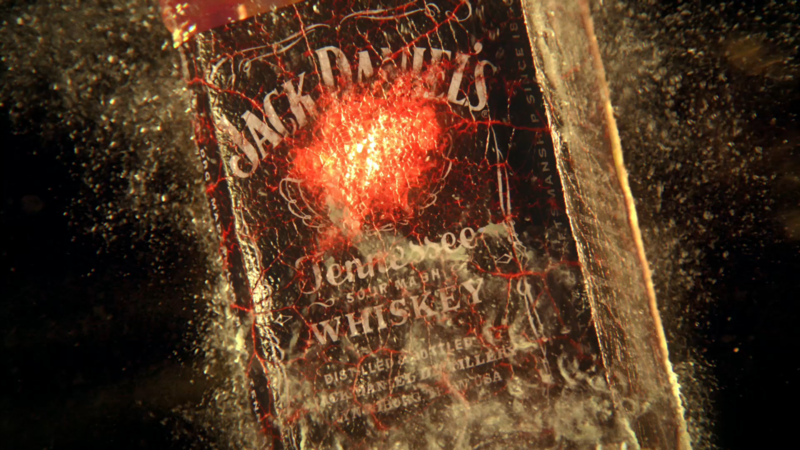 Thanks to a strong collaboration with Arnold Worldwide, the team was able to pull off this visual effects-heavy spot to announce Jack Daniel's hot new addition to the team.